Anke Smith receives her award from the School of Aviaiton manager of professional programmes Frank Sharp. School of Aviation business development manager Anke Smith always rolls up her sleeves when it comes to organising the School of Aviation’s Wings ceremonies. She knows how important the events are to aviation students because it celebrates their achievement of their commercial pilot’s licence. Special academic and other awards are also presented so, for most students, their Wings ceremony is just as important as their graduation. 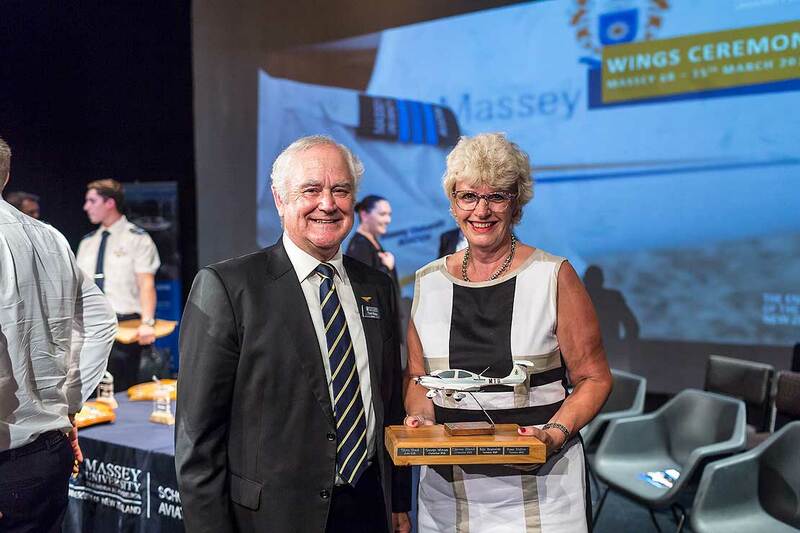 Amongst the awards presented at last week’s Wings ceremony was the Manager of Professional Programmes Award, which is given to a person who has contributed “innovation, energy or inspiration” to the School of Aviation. Despite playing a key role in organisating the event, Ms Smith had no idea, until the moment her name was read out, that she had won the award. “I had no idea that my name was on the ‘real’ run sheet. Someone else’s name was on the run sheet I was given as a ‘dummy’ to operate from,” she says. Vice-Chancellor Professor Jan Thomas with Anke Smith and all the Wings recipients at last week's ceremony. Ms Smith says she was taken completely by surprise, but “it is a great honour to be signalled out for recognition by one’s peers”. She joined the School of Aviation at the start of 2009, moving from Massey’s International Office. The school’s manager of professional programmes Frank Sharp says she has played a key role in the programme’s ongoing development. “Her travel around the nation meeting with aspiring candidates and their families, her attendance and ongoing delivery at aviation information evenings, both at Massey events or in conjunction with our fellow training providers, has been tireless and productive,” he says. Ms Smith lists many successful Wings ceremonies and School of Aviation Open Days as things she’s proud of from her time with the school, as well as seeing Massey’s aviation programme develop. “I recall on my first Aviation Open Day in 2009, which I ran unaided. I hosted six trial flights; the 2018 Open Day hosted 58 trial flights and now involves a team of people from the school but also volunteers and industry presenters,” she says. But she says receiving updates from aviation alumni that are doing well in their careers brings the greatest satisfaction. 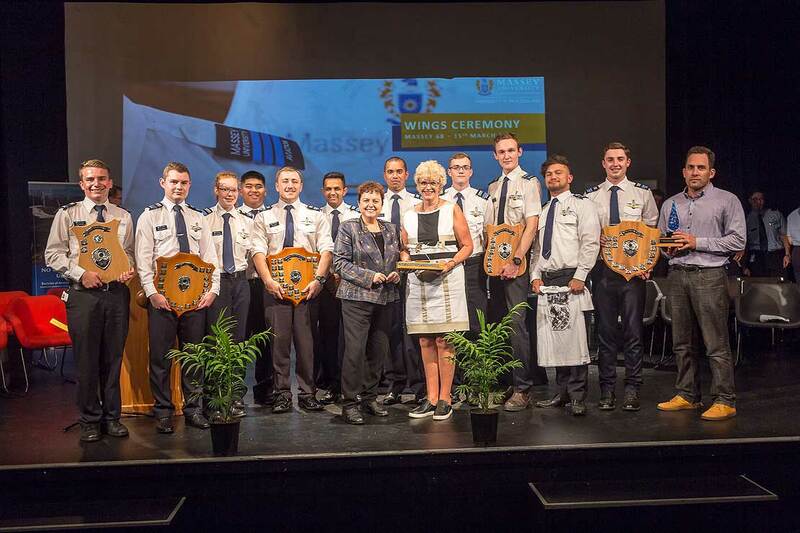 “I feel proud seeing so many students achieve success by way of their aviation qualifications, sometimes in the face of significant personal challenges,” she says.